Sadly, my New Year's did not go as planned. I had intended to go out for a nice dinner with my friend Mary, watch a bunch of old movies at my house, and enjoy this for dessert. A few days before the festivities, I got a call from a frantic mother asking for a babysitter. As I was completely broke and had just learned that Mary was going to dinner with her family, I decided to take the job. After New Year's, I was a hundred dollars richer, but I was still hankering to try this dressed up Jell-O. Doesn't it sound so much more glamorous to call it gelée? I think so too. Anyhow, starting back to school and taking care of Riley all seemed to get in the way of making this; also, kumquats are not hanging out in my grocery store, which made things even more difficult. Yesterday I was finally able to put together the gelées. I made the actual gelatin base the night before, but I waited until yesterday because a friend of mine was bringing me kumquats from her garden. The actual process of making the base is as simple as can be. 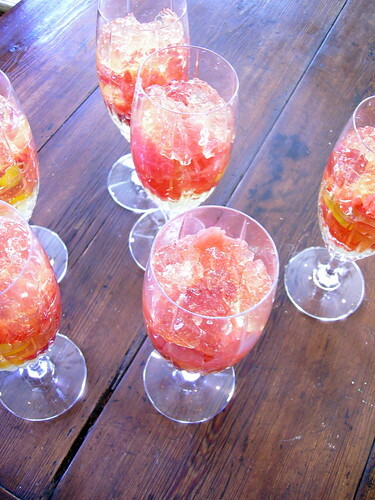 The true work in this recipe comes from peeling and segmenting the grapefruits and oranges. I stirred together half a cup of water and two packages of gelatin in a large bowl and let it rest for five minutes to dissolve the gelatin powder. Meanwhile, I made a simple syrup on the stove using half of a cup of water and a cup of sugar. I poured the warm syrup into the gelatin and stirred to combine everything. My next task was pouring the Champagne in. I am embarrassed to say that I did not know how to properly open a wine bottle, so I looked up a tutorial on the internet. Thank God for the internet! You can learn how to do just about everything on there. After safely opening the bottle, hearing a whoof and not a pop, I poured the entire bottle into the bowl. It foamed up quite a bit, so it was a good thing that I had used such a large bowl. I transferred the liquid to a plastic container, put it in the fridge, and let it solidify overnight. After arriving home from school and making myself a delicious salad for lunch, I set out to prepare the citrus. I sliced the kumquats into thin slices and removed the seeds. I put them into a pot of simple syrup and let them steep for fifteen minutes. I peeled and segmented three grapefruits and two blood oranges. The recipe only called for regular oranges, but I could not resist the gorgeous ruby color of the blood oranges. 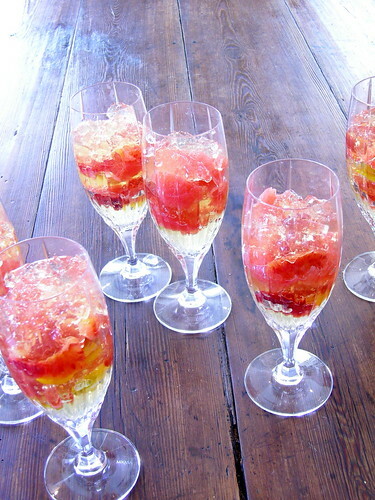 I pulled out six pretty, crystal glasses and began to assemble the gelées. I scooped a bit of the gelatin into each glass. I plopped a few slices of kumquats, some orange segments, and a handful of grapefruit slices into each glass. I continued layering the gelée and the fruit until all of it had been used and evenly distributed. How in the world was I going to consume all of these? I certainly couldn't bring them to school because they contain alcohol. If any of you want to pop by for a glass, feel free to do so. I was surprised at how much I actually liked these. I had feared that the flavor of the Champagne might have been overwhelming, but it really wasn't. It was more of a understated hint than a smack-in-the-face. They would have been the perfect way to end 2009-with a bang! Pour 1/2 cup water into a large bowl. Sprinkle gelatin over water and allow to soften for 5 minutes. Heat remaining 1/2 cup water with sugar until sugar dissolves. Pour syrup over gelatin and stir until granules dissolve completely. Add Champagne and lime juice. Cover Champagne mixture and refrigerate until set, at least 6 hours. Heat sugar and water until sugar dissolves. Add kumquats and soak for 15 minutes. Drain off syrup. Spoon some of the chilled gelée into each of 6 glasses. Add a few sections of fruit. Spoon more gelée over fruit. 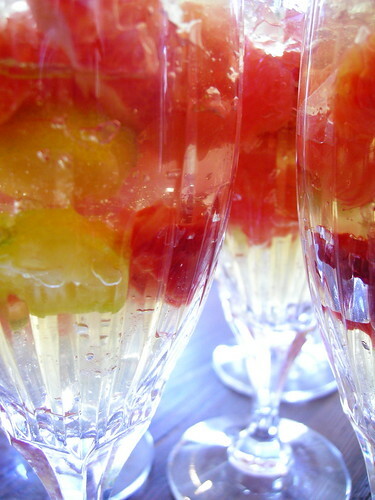 Continue to layer fruit and gelée until each glass is finished. Chill until ready to serve. I would love to try this gelée. It looks so beautiful! this does look really good. and also a fun, in expensive and festive thing to make as a group. drink = conversation piece ! !